You want your rooms to be free of water. You can hold your breath for only so long. You are slow when underwater. With all of these obstacles, it can be very tricky to build an underwater structure. Nevertheless, it can be done by obtaining the necessary gear that helps your character survive construction, breathe for a longer duration, and extract or displace water from a specific area. Respiration: This enchantment is for your helmet that lets you hold your breath much longer and see clearly underwater. If you get the highest possible level (Respiration III), you can stay underwater for an extra 45 seconds without taking damage. Aqua Affinity: This enchantment, another one for your helmet, lets you destroy blocks underwater just as quickly as you can above water. Depth Strider: This enchantment is for your boots. 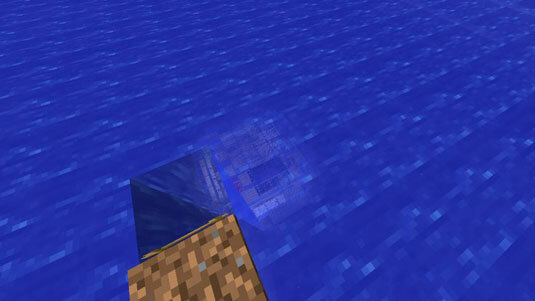 With this enchantment, you can move much faster underwater. The highest possible level (Depth Strider III) lets you move as fast as you can on land, though you can’t sprint underwater. Your best bet for clearing out water is sponges, which can soak up a lot of water at a time and be dried out in a furnace. If you don’t have many sponges, you’ll want lots of cheap, easily destroyed blocks, like sand. Source blocks are destroyed by placing solid blocks inside them, so you can fill your rooms up with temporary blocks to blot out all the water. When you’re ready, you can begin building your masterpiece under the sea. The toughest part of the construction is clearing out the water from your rooms so you can actually live under the sea without drowning. This can be done in one of two ways: sponges or source blocks. Your best bet for clearing out water is sponges, which can soak up a lot of water at a time and be dried out in a furnace. It turns out that getting sponges is very tricky, requiring that you go to an ocean monument. Sponges can be found in sponge rooms which are randomly generated in the water temple, or, one is dropped when you kill an elder guardian. If you don’t have many sponges, you’ll want lots of cheap, easily destroyed blocks, like sand. Source blocks are destroyed by placing solid blocks inside them, so you can fill your rooms up with temporary blocks to blot out all the water. Go underwater and start building the exterior of your structure. Construct all the floors, walls, and ceilings. Keep building until all the walls and ceilings are finished. Make sure that no more water can enter your structure. If you miss a spot, don’t worry — the problem will go away if you just patch up the part that’s leaking. It’s probably full of water right now. Remember that water can’t pass through doors, fence gates, and the like — you can build a gateway right out into the ocean, if you want. Place a furnace in your building. You can ignore this step if you have a lot of dry sponges. Put sponges next to the water source blocks. This step soaks up the water and converts your sponges into wet sponges. If water remains, put your wet sponges into the furnace. By cooking wet sponges, you can dry them out so that they’re ready to use again. Continue soaking up the water until it’s all cleared out. Continue designing the interior of your structure. Grab the necessary building materials, along with a bunch of dirt or sand blocks. Both dirt and sand have their advantages, but it’s a good idea to use sand — it’s affected by gravity, so it can easily complete Step 4. Besides, you can destroy whole columns of sand quickly by destroying the bottom block and immediately replacing it with a torch or pressure plate or another nonsolid block. Build the floors and walls of your structure. Fill up the entire structure with the dirt or sand blocks. Build the ceiling of your structure, and be sure to fill any gaps with dirt or sand. Destroy all excess dirt and sand, revealing a water-free interior. Get rid of any leftover water by picking it up with buckets, or by placing blocks in the sources. Decorate the interior of your structure.